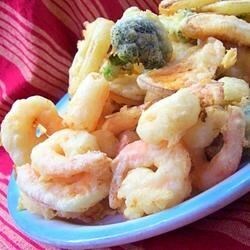 "Serve these crisp, fried shrimp with a hot mustard sauce or sweet & sour sauce. The tempura batter may be used for other recipes. Try it with vegetables." Shrimpful and full of flavor! Good recipe, the key is not to marinate the shrimp though! or at least that's the way I liked it! when marinated it tasted way too soury, not they way they serve it in a Japanese restaurant! Very Good tempura batter, I tried this recipe for chicken nuggets....excellant crispy, and golden brown, just perfect for sweet and sour chicken nuggets. We enjoyed this batter a lot! I used it on vegetables and it was great. Some of the veggies soaked up too much of the vinegar though! Yum! I made the tempura batter for a fondue dinner and it was a huge hit. Very easy to prepare, clung well to the dippers, and fried up beautifully. Thanks!